Please note that I only work with companies and products that I feel passionately about and that align with The Defined Dish’s views and that this post contains sponsored content from ALDI. While I am compensated for the work I do, my opinions are always 100% my own. 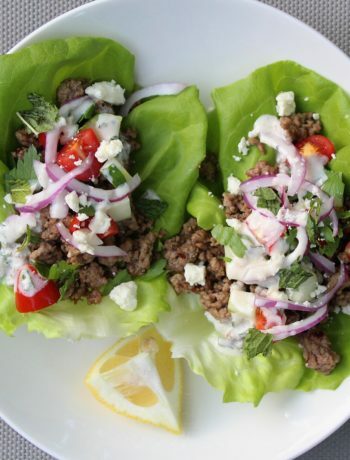 Whipping up a healthy, hearty weeknight meal doesn’t have to be time consuming. 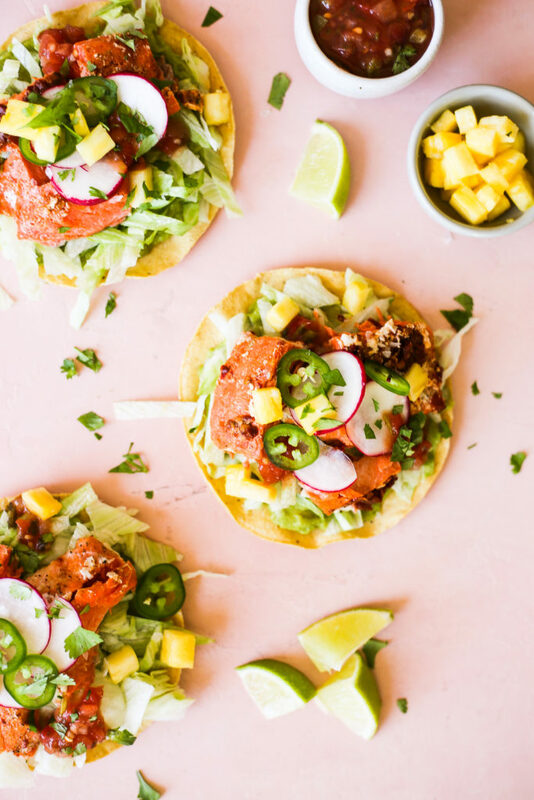 These Chipotle Salmon Tostadas are proof of that. 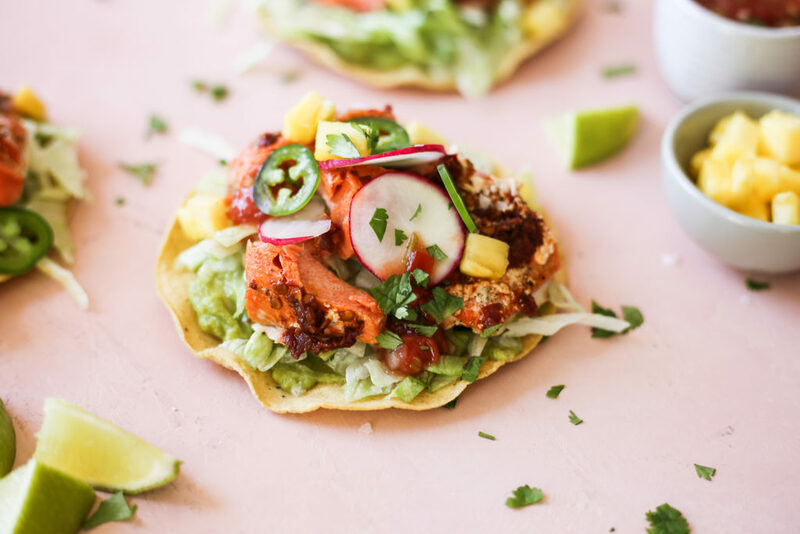 All you have to do to get dinner on the table is pop a simple chipotle-lime flavored salmon in the oven while you prepare some good store-bought tostadas with garnishes like guacamole, lettuce, salsa, pineapple, and more. 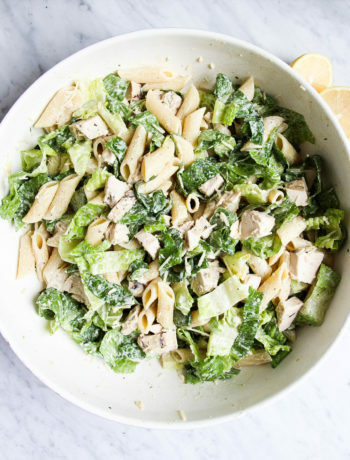 From start to finish, this dinner takes no longer than just 20 minutes and is bursting with flavor! Springtime has just peeked its beautiful head in and I just love the food of the season. Bright dishes shine, and light, delicious fish dishes are on regular rotation in my home. All of the ingredients in this wholesome, weeknight meal are from ALDI. Every time I visit ALDI stores, I am constantly amazed by their impressive prices and selections. Their delicious Specialty Selected Wild Caught Alaskan Sockeye Salmon was the star of the show in this dish. I simply seasoned it with a little salt, pepper, and cumin then minced up a chipotle in adobo and spread it all over the top for a little kick. The salmon is then topped with lime rounds and baked until it is easily flaked with a fork. I absolutely LOVE the flavor of the salmon and it’s in and out of the oven in just 10 minutes! 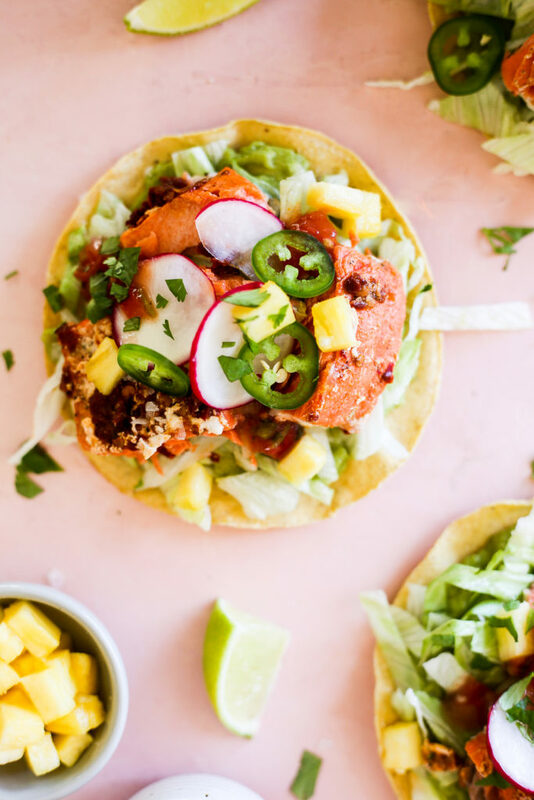 The flakey salmon piled high on a crispy tostada is one of my favorite things. I smothered my tostada in the clean-ingredient prepared guacamole from ALDI and their fresh prepared salsa. YUM. 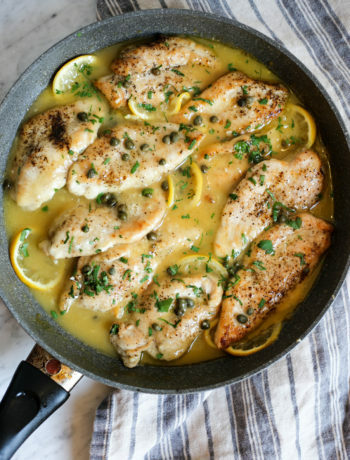 The entire dish comes together just wonderfully and I know it’s going to be a go-to dish for all of you throughout the spring and summertime. I encourage you all to explore the wide selection of both fresh and frozen seafood products that ALDI has to offer, as well as their fantastic selection of seasonal produce. You’ll seriously be amazed by their impressive prices and quality! You can also use the code ALDIDISH $10 off your first three ALDI orders on Instacart of $35 or more. Preheat oven to 375 and line a baking sheet with parchment paper. 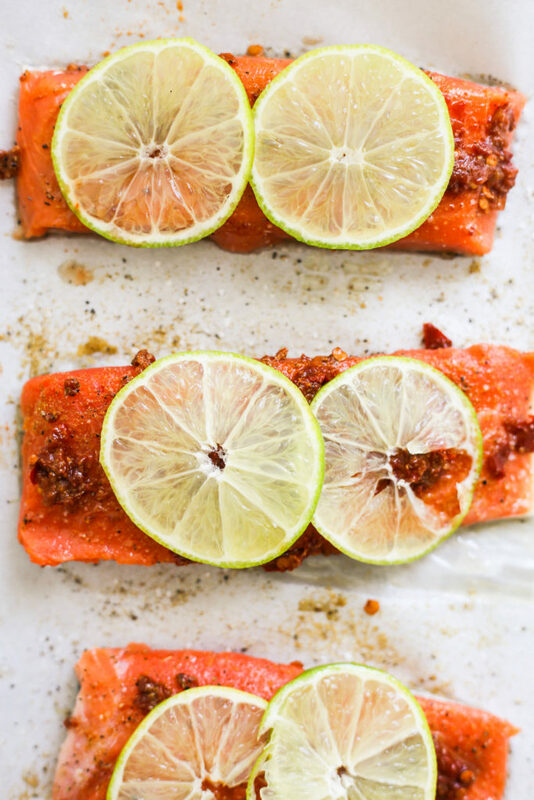 Place salmon filets on the lined baking sheet. Brush with avocado oil and sprinkle with salt, pepper, and cumin. Evenly divide and brush the minced chipotle over each filet. 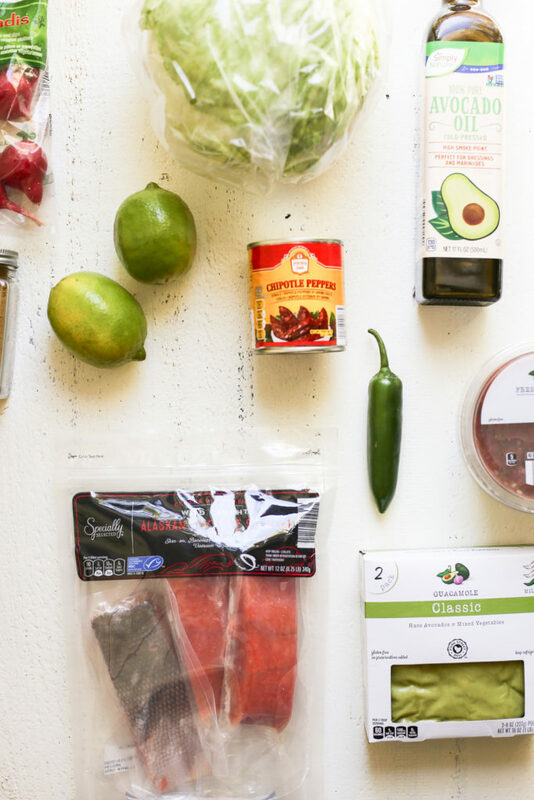 Top each filet with two rounds of thinly sliced lime. Bake salmon for 10 minutes, or until salmon is cooked through and easily flaked with a fork. Once cooked, remove skin and flake salmon with a fork. Spread guacamole on the top of each tostada. Layer with iceberg, the flaked salmon, radishes, pineapple, salsa and jalapeno. Serve with a wedge of lime. Enjoy!